and a simple charming wreath for fall- yes, please. and lots of pretty autumn inspired flowers. and also for something else behind the scenes. I thought I would share a simple and quick diy with you today. if you wanted to be able to enjoy it for longer than a couple of days. and that the flowers can draw water from. That will help keep it looking fresh longer. so I wasn't really thinking about it drying up and not being pretty. Really- whatever you prefer works. and with placing the larger bits like the artichokes. 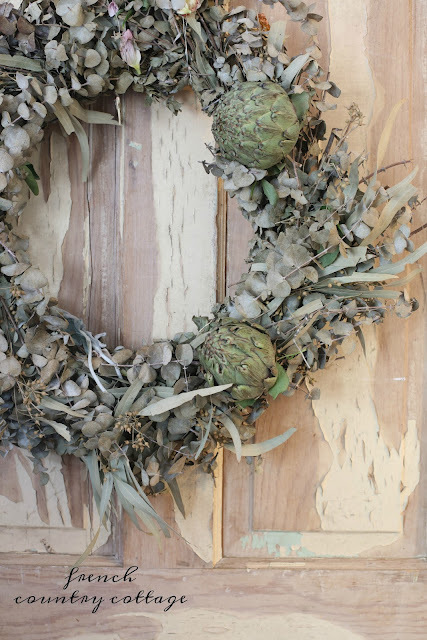 With the artichokes, you can simply wire them right to the wreath. 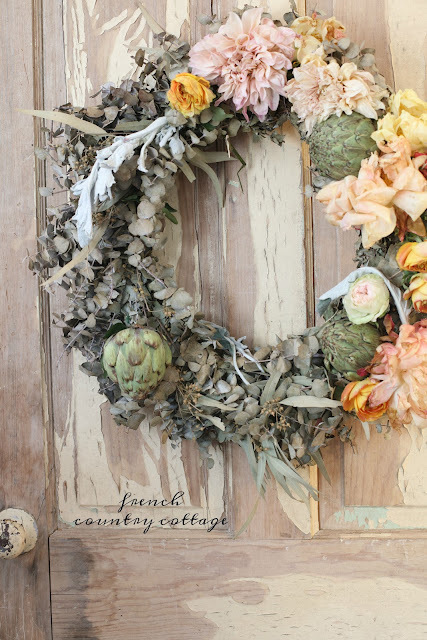 Repeat until you have all the artichokes placed - I used 3 for this wreath. Up next, I started to place the flowers around the artichokes. Another option is to wire them if you prefer and it definitely will hold them tighter to the wreath. I used just a few pieces of dusty miller- mainly where there was area that needed filling in a bit or tucking a small piece in between the flowers. so they are a good one to go ahead and use wire on if you need to. and tie around the wreath. Up next, tuck the smaller flowers like the roses here and there to fill in. that like that look ranunculus. just go with what is pleasing to your eye. or a bit less and adjust. when choosing what you will work with. or simply enjoy them and how they change as they dry. Gorgeous! I would buy this in a heartbeat! 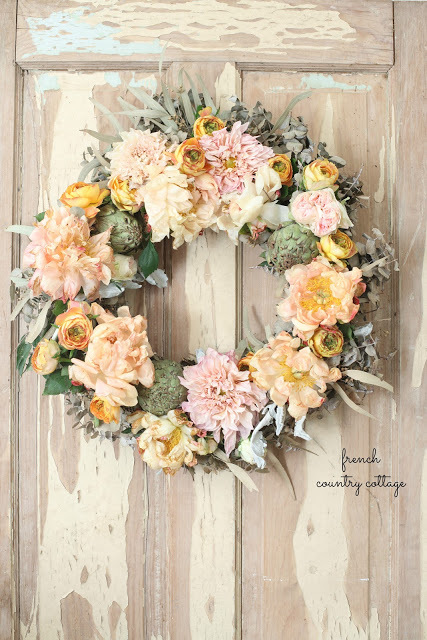 Always wanted to try creating a wreath like this...you have inspired me to do so!...Gorgeous Courtney!! 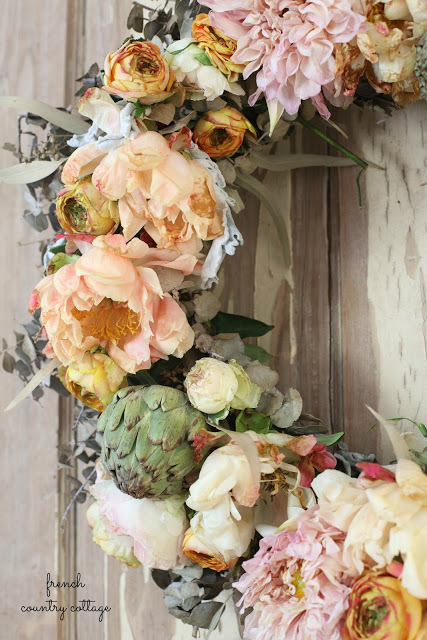 I love your simple natural creative touch with flower arranging. I too, am inspired by your talent and love of fresh, dried flowers. Thank you so much Courtney! 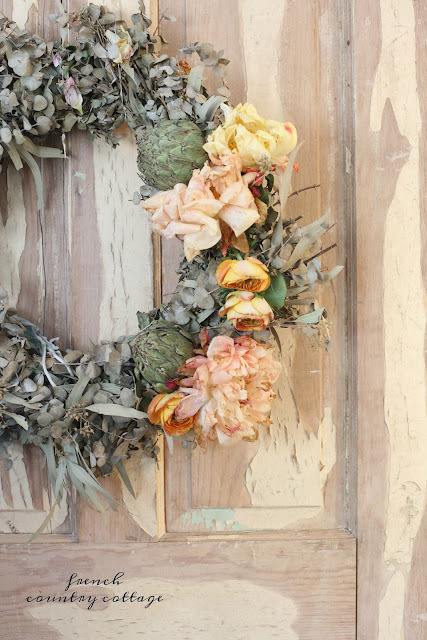 Oh what a beautiful wreath. I must try and make one too. Its so amazing. Courtney, this is absolutely gorgeous! Like heartbreakingly beautiful! Courtney, this is so gorgeous! I'm in love! 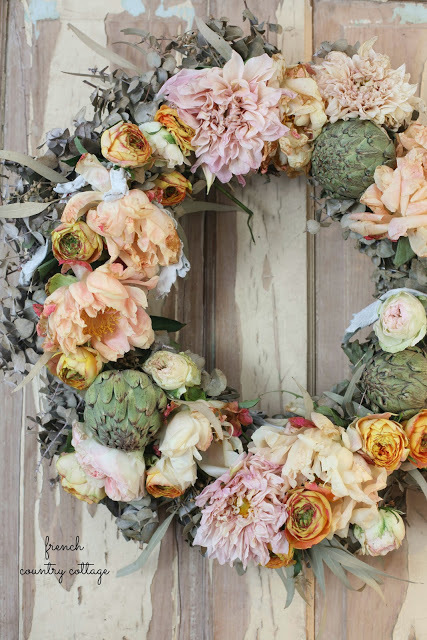 I've never made a real flower wreath but now I want to! Courtney this may be my favorite wreath of all time! I can't wait to make on of my own. Thanks for the inspiration!